While I don’t use 4-week T-bills as a short-term saving vehicle any more, I still keep an eye on the rate changes, though I don’t expect the rate to become competitive any time soon after the sharp drop in September, especially after two consecutive rate cuts. 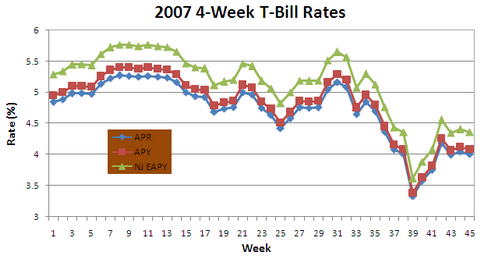 The latest 4-week T-bill rate is at 4.008% APR. That’s equivalent to a 4.36% APY for New Jersey residents, putting it slightly above ING Direct after the bank lowered its rate again immediately after last week’s rate cut. Now that IGoBanking falls behind in the rate game, I am thinking maybe it’s time to move on. AmTrust and UFB do look attractive with 5.30+% APY (hope they can keep the rates). I considered these two banks before when I was looking for a better bank than Emigrant Direct and HSBC, but eventually chose IGoBanking. Maybe I need to pick it up again. Of course, if I get another account, I will need to close IGoBanking or FNBO Direct or both so the number of accounts I own won’t keep going up. I show WAMU’s savings square as being 4.75% now. Have Amtrust, FNBO, UFB, WT adjusted rates yet in response to the fed rate drop? If not, I think I’ll wait another two weeks to see if they do. UFB sounds interesting…any experience with them? I just tried to go to AMTrust website and it was down. I have had this experience before, which does not give me confidence with them. Countrywide’s savings link is at 5.35% APY w/ 10K min. FNBO has been steady at 5.05 since they dropped near the end of Sept. They have not moved (yet?) since the last Fed rate cut. I’m starting to look again too as I have my money at WAMU and Electric Orange (now both at 4.75% 50K+ rate). If WAMU had held on I would have moved the ING money there and lived w/o a few points for convenience factor. Just an FYI about UFBdirect (UFB), i had opened an account with them for the rate, but was dissappointed to find that they did not offer ACH electronic bank to bank transfers….you can still do it by paper mail or wire transfer (fees). I think you need to start exploring foreign currencies savings or CDs, at Everbank for one. In lights of declining US dollars and much worse to come, what’s the points to chase ever dropping US saving rates?